Tropical Art Classes develop creativity! So much beauty surrounds you! How you may wish that there were easily accessible tropical art classes, which would help you to gain important visual or written skills with which to express your ideas! Perhaps some of you would like to learn oil painting, how to sketch, find out about perspective drawing or are wanting to build careers in fine arts. 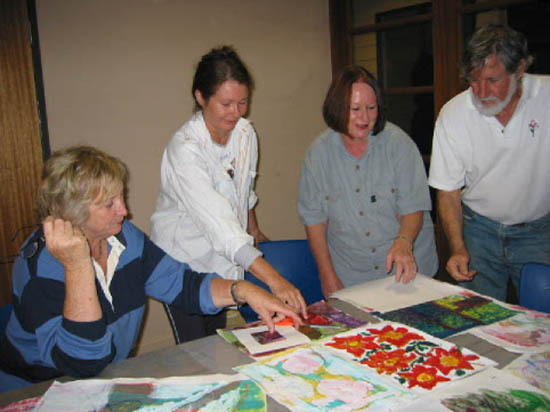 Many art groups in small and larger towns in North Queensland provide a variety of tropical art classes for residents and visitors alike. You may need to ask around to satisfy yourself about the level of professionalism and the emphasis of the different groups. For example, a group may emphasise craft skills such as art glass , pottery, sewing, weaving or leather work or the more traditional fine art skills of drawing, painting and sculpture. 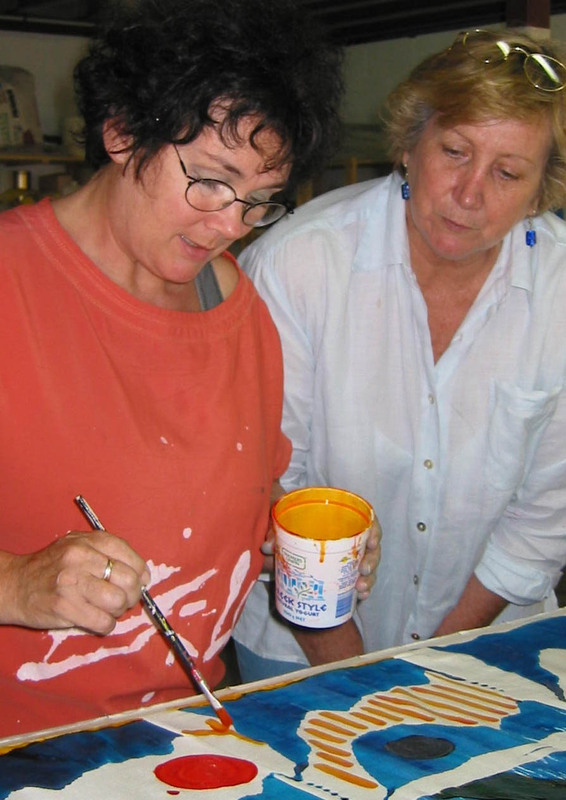 They may hold regular, structured courses with defined aims and outcomes, leading to careers in fine arts or be more of a social networking group where people of similar interests may learn how to sketch, sculpt in clay or paint in a convivial atmosphere. Tropical art classes may include writing, music and performing arts, as well as the visual arts, to add another dimension to your creative experience. Here you see students from the Port Douglas language School proudly displaying their morning's work. I am sure that you will be pleasantly surprised by the friendly welcome that you will receive and by the reasonable fees asked. I have seen many a new friendship forged over the printing press, indigo dyeing vat or during an outdoor sketching class! Sometimes a course of a certain length would not be suitable if you can only stay for a few days. But then, a weekend workshop where you learn oil painting basics or some aspect of watercolour, that you have always wanted to explore, might be just perfect. If you can't just hop on an aeroplane and come, you might like to explore one of the on-line "how to paint or draw" sites, which usually provide free information. Have you always wondered how the old masters, such as Rembrandt and Vermeer, perfected their oil paintings? Wonder no longer. Delmus has the answers! For detailed instructions on various oil painting techniques check out these well thought out methods that Nick has developed. Teach yourself to draw? Kerry is living proof that anyone can draw; all you have to do is try it. If you need any encouragement, you'll find it on her site. Simple pencil drawings are displayed for every subject - enjoy! For residents of North Queensland the choice is amazing. It would almost be worth moving to North Queensland for a few years just to sample some of the hobby and vocational tropical art classes on offer! For an introduction to hot glass, Hoglunds Art Glass studio sometimes holds one hour or one day workshops in the Whyanbeel Valley - by appointment only. No experience needed; this instructive and fun activity is brilliant for small groups or individuals.